Is it possible to warm-up too much? It was so funny when I ran ultra-marathons. They’d announce 5 minutes to start time and most people are still sitting in chairs or just gabbing with each other. These are usually trail races that extend past the normal 26.2 mile marathon. They last from 5 to 24 hours and beyond. The goal is to expend the least amount of energy possible for the long haul. So warming up is really a waste of energy. During this time, I signed up for a 5K or two. It was hillarious because you’d see people running and sprinting all over the place. I mean, its a 5K right? I really think they ran a 5K before they even toed the starting line. So is it possible to warm-up too much? I think it depends on what you are doing. 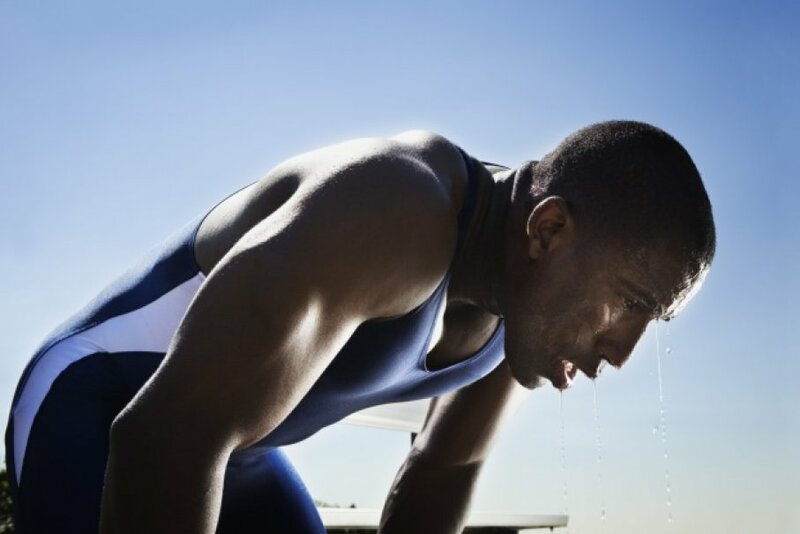 For a very low-intensity exercise of extended time, your workout is basically your warm-up. Say you are on a rowing or elliptical machine. They are low impact so you can start slow and work into a sweat. There isn’t much worry at all about getting hurt. Well, unless you are a very out of shape person who has lived a very sedentary life. But that excludes most of us who are working out. Now, picture a Top Fuel Eliminator dragster that is doing a quarter mile in under 5 seconds. It pays to have the engine up to full temperature. They also do an intense burnout to heat the tires before they go. This also tells you that your engine is ready. So for an Olympian doing a 100 meter running sprint, yeah they are going to do a serious warmup of movements and stretching. The wheels can come off so easily with that intensity. The same for a heavy CrossFit workout that includes heavy deadlifts. Or maybe a Strongman competition where intensity is through the roof. These are the times when you warm-up in a very precise way. Just about the time I was getting ready for my CrossFit Trainer certification, I was watching a lot of videos and reading as much as I could. One video was a road tour with Spencer Hendel and James Hobart. They would visit CrossFit boxes and join in on a workout wherever they went. They were so funny because they called their most intense efforts as going HAM (Hard as a mother *censored*). They always seemed a bit tired since they were on the road a lot. So they often skipped a dedicated warm-up. They called it going JAGUAR. I love that term. They just jumped in and got down to business. I used to go to a CrossFit box in town. The hour flow always went the same way. You do a warm-up, often a run, row, or calisthenics. This led to mobility that related directly to the Workout of the Day (WOD). And then a strength segment that was also related. At the end, you’d do the WOD. You’d be totally smoked and then go about your day. The problem I had with this idea is often you were doing a benchmark workout where you wanted the best time you could get. Say you were doing Diane with heavy deadlifts and handstand pushups. But you already did deadlifts and handstand holds in the strength portion. Yeah, it warmed you up, but maybe it took a lot out of you too. Then you can’t go 100% in the WOD. If I were the coach, I would program a specific warmup to the WOD, and then go right to the WOD. Then you guarantee success for your athletes. It would be perfect to do a burnout session after with an EMOM or strength with deadlifts or presses overhead. TBH, I go JAGUAR in most of my workouts. I don’t do any warmup at all. I might do a rep or two or something that relates. But otherwise I jump right in. A WOD is an amazing warmup for a strength portion. I often blow my wad so badly with strength, I wouldn’t have energy for a WOD at the end. Another way around a warm-up is to have a buy-in and buy-out. So as part of your WOD, you tack on a 1K row or 800m run or something before and after the AMRAP or couplet that you have prescribed. Then you have the best of all worlds. Sometimes, I even add the strength into the WOD. So if you do a Deadlift workout, it could look like this. Then you have everything covered. And the little rest keeps your back safe during a heavy WOD. So to answer the question, it is possible to warm-up too much. A majority of us doing fitness don’t need much of a warm-up. Maybe for some of the Top Fuel people out there, yeah, its smart to warm-up. But don’t overdo it to the point where you end up with poor performance. I’m not signing up for the actual CrossFit Games Open this year like I’ve done in years past, but I do plan to do all the workouts on my own. What makes CrossFit different from many other fitness endeavors is that its a community. We all are doing the exact same workout. Its why I love Ashtanga Yoga too. Somewhere, someone is doing the exact same sequence I’m doing. So when I’m doing the CrossFit WOD and I’m struggling with something, I know there are thousands of others feeling the same struggle. I know I don’t have to feel pity on myself even though I’m doing this by myself. And, since years of teaching yoga, I’m not fraught with comparisons anymore. But I’d still like to know that my effort is comparable and that I’m on track with my fitness. Since I am a Master’s athlete, I am strongly considering doing the Festivus Games (for real). I honestly struggle with some CrossFit movements, so actual competitions would be difficult. But this is made for the novice-intermediate athlete. And I’m sure I could work with the Rx weights and movements of the intermediate athlete, I’ll probably do the Master’s options. Yes, I can do lot of pullups, but I’m not going to be shy with only doing ring rows. Being a yogi means that I’m OK with whatever I do. No judgement, no self harm. I am signed up for the Wanderlust event in Chicago this May. I used to be an ultramarathoner. Going out for a 6 hour training run wasn’t a big deal at all. And a 50K race was my jam! But injuries started to creep in to where it was difficult to run a half mile without my calf going haywire. In the old days, a 5K was a warm-up for something bigger. Now, that’s going to be my race. But you know what? Even in the little things, we should strive to do well. So I’m using the Festivus Games training as my training for this race. I can shift to more specific running in the few weeks prior. My muscles and heart will be strong already. So that’s my plan and should keep me occupied until Summer. Then I’ll be ready for swimsuit season — haha!!! I had a back injury (non-CrossFit) that kept me from working out late last Summer. Then I did my own rehab for about a month. When I felt I could start taking a load again, I went back to CrossFit. I started with the daily CrossFit.com WODs and eventually shifted to my own programming. Then the holidays kind of derailed all my good intentions. I ate a lot and sat in a car for hours to and from family visits across the country. Good habits can be broken. So at the New Year, like most people, I vowed to make some changes. I don’t do resolutions because I think resolutions are made to be broken. I wanted to get back to a strong deadlift. And I wanted to make some body changes. So I start programming for those things. Lots of powerlifting and bodybuilding were thrown into the mix. And just because I know I need to control my bodyweight, I did some cardio as well. I was rowing, ski erging, and running. But all of that gets very boring. I started skipping workouts. I didn’t have time to get through all I wanted to get through and then would just not do it. It just wasn’t working. So last night, I look at my sheet that has all my tasks for the day; the same things I’ve been doing since the New Year. I glared at my sheet and threw it in the trash. I programmed a triplet of trap bar deadlifts, dips, and wallballs. Nothing crazy, just something simple. Three rounds only took me 4:50, but it gave me that air sucking, nerves tingling into my fingers and toes, wanna lay down and die kinda feeling. But when the waves of pain goes away, you know you’ve done something. It combined all the things I had been doing for an hour into 5 minutes. Did you hear that? 5 minutes!!! That’s not all I did, but that’s all I had to do. I’m lightly sore this morning and its all good. The key is: do a little warmup (something fun: I do hula hooping, pole dancing, trampoline hopping, BOSU ball balances). Then set up a wod. Make it something DO-able. Don’t make it crazy. Maybe add a moderately heavy movement and a bodyweight movement. Optionally add a cardio component like box jumps, burpees, or double unders. Then that’s all you have to do!! If you feel you have more energy, do some heavy work or bodybuilding. Olympic weightlifting is my Go-To since its mostly concentric (i.e., it doesn’t make you so sore). But the Oly’s also test mobility, balance, speed, and power. That’s it. Just do the WOD if you don’t have time. Then you’ve already done a lot! A good friend of mine just finished teacher training and she got me thinking about sequencing. We learned different ways in teacher training and they were different from what I read in books. I don’t know that I’ve seen a lot of hard and fast guidelines about this. I think much depends on the kind of class you are teaching. But the structure usually finds commonalities across disciplines. The yoga teacher who I emulate most taught a Sunrise class on Saturday mornings. He was an incredibly introspective and kind person. He was also very capable to not only teach but to demonstrate technical postures. I loved his tone and his demeanor. He was very stern about certain things. When going into chaturanga he would insist “don’t you dare look down”. When we brought our leg forward and back in Surya Namaskar B, he would push us to not make a sound on the mat thereby engaging hip flexors and lower abdomen. Occasionally, he would look at his sheet to see where we were. I admired how much he thought about his classes. You could see him practicing his sequence before class. While I was in training, he showed me his process and what he wrote. It was all in Sanskrit. I once mentioned this in teacher training and my teacher humbly acknowledged that his procedure was a good one. But she confidently said that what she does in a vinyasa class just comes from experience. Her sequences are creative and largely fall onto her Ashtanga base. As I look at what I do today, it combines both approaches. Sure, a general vinyasa class takes no preparation at all for the most part. You just go in and teach. You may ask students what body part or pose they would like to focus on, but otherwise its up to you. In specialty classes, you need to develop a more thought out plan. Slow flow, gentle, restorative, beginners,… all require some level of focus if you don’t teach that all the time. So you may scribble out some ideas. So what I do is usually off the cuff, but I write down a few peak poses now and then that I’d like to cover. Warming – I once went to a class where the teacher’s first pose involved a deep hamstring stretch. I cringed with worry that someone would hurt something. Sun Salutations are the go to for Ashtanga Yoga. It covers the most ground while building heat. However, most beginner/intermediate classes require more warming than that. Child’s pose, tiger, cat/cow, seated twists. These are good starting points. I also like standing sun flows. Heating – Once we are warm, I go into stronger poses. Planks, chaturanga, arm balances, warriors, triangles, side angles. These fit along with my Ashtanga bias as well. If I feel we are getting tired, I mix some balance poses along the way. Forward Folds – Now that we are nicely opened, we can do wide leg forward folds, goddess, and hand to foot type poses. Seated poses – The last third of class I do one and two legged forward folds; reverse plank and boat pose; then maybe marichyasanas and baddha konasana. Backbends – Bridge pose and upward bow are stalwarts of any class. They are good completion to seated poses. Inversions – Even if it is a beginner class, we do some form of inversion (meaning heart higher than the head). It may be hand stand prep, supported shoulder stand, or legs up the wall. Or we may go for headstand, forearm stand, shoulder stand, and handstand. Twists – We always try to finish with twists and maybe crunched positions like knees to chest. This is what makes our bodies feel accomplished and ready for what life has for us. Savasana – I come from a traditional and Ashtanga based practice. Since Samadhi is the highest of the 8 limbs, I feel it is the most important. We feel our greatest peace and bliss in corpse pose. The general rule is 1 minute of savasana for each 15 mins of practice. When I’ve taught in fitness gyms, they don’t acknowledge its importance. To some its just a waste of time. Its one reason why I prefer to teach in a yoga studio. Students there have been trained to understand the why. I’ve been to a lot more classes lately where many of the rules I follow are different. I really love Baptise style yoga, but it seems we miss out on most of the seated postures. A lot of Vinyasa classes do very few seated postures, if at all. I think its how people are trained these days or maybe they don’t come from an Ashtanga background. We also see a lot of repeated sequences and postures. I can understand the reasoning, but it bores me a bit because I know there are so many other poses that we can experience. And I get a little tired of just standing for an hour. But people embrace these classes and it makes me happy for those students. I personally prefer the variety of a complete practice. My best advice to a new teacher is to find a basic sequence that includes all the required elements. Then you can add and subtract from that sequence. We are taught in speech classes that you don’t want to read a text word for word. You bore the heck out of your audience that way. Instead, speak extemporaneously and maybe have a few key points listed. Write out a few peak poses or area of emphasis. But you don’t need to memorize a sequence or write out an entire list. You have to interact intuitively with a class to know what they need and want. If beginners wander in, you need to meet their needs while also making it challenging for the most advanced student. Give options and make it possible for everyone to practice. I bought a new book on Thai Yoga and I totally ate it up last night. I’ll give more details later, but I just want to say how excited I am to learn something new. Thai healing goes back 2,500 years and involves several disciplines. Many are somewhat familiar with Thai Yoga Massage, or “Lazy Man’s Yoga”. There is also an Ayurvedic medicine component. But what most aren’t familiar with is actual “Thai Yoga“. It is a self-healing practice based on yoga poses. The level of detail in symptomology is very amazing. In many schools of healing in Asia, human dissections was something that wasn’t done, so familiarity with actual anatomy is not present. However, they have a very intuitive knowledge of energy. There are 10 major sens lines that travel through the body that are key to Thai healing. Actually, there are thousands, but we consolidate for practice. So I’ve begun to learn about this energy and how it is useful to healing. I am going to start a Thai Yoga practice for myself and to see if it fits with me. As I was reading last night, I was visualizing and mimicking what I could as I sat in my recliner. I don’t know if it is just the power of thought or if I was actually feeling what I was feeling. I actually felt an amazing difference just walking through poses. I am so excited to develop this practice. I will share more when I know more. Right now, I’m just at the tip of the iceberg. I’m hopeful this will bring healing in my own body. Then I hope to share with others. Maybe it will begin as a class in Thai Yoga. We’ll see! !